The first meal of the day is very important since this is when your body is most acidic. Starting your day with an alkaline breakfast is critical in helping your body create the perfect environment for healing. Below are some suggested recipes to get you started. Feel free to adjust the recipes to your taste preferences. Please keep checking our website as we are continually adding new recipes and will be including notations on how to make the dish suitable for a low glycemic alkaline diet when appropriate. 12 oz. of lemon water – squeeze ½ large lemon or one small lemon into 12 oz of water. Lemon water is a powerful alkaline drink and the perfect way to start the day. If you are desperate for added sugar, you may add 3 dates chopped small or made into a paste using the blender by adding small amounts of water until paste-like consistency. Dates, although high in sugar, are easily absorbed and assimilated into energy in your body. Although it is preferred that you do not consume sugar because it supports inflammation and tumor growth in addition to an acid environment, until your taste buds acclimate, a little first thing in the morning would be okay. But try to wean yourself off of sugar as soon as you can. 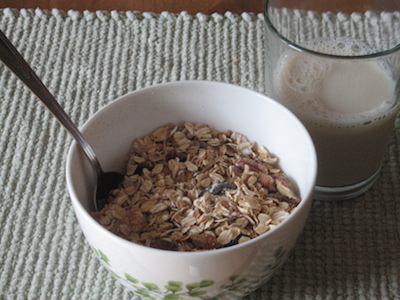 Alkaline granola – slightly toasting raw oats gives them a nutty flavor and crunchy texture. Spread 1 cup of raw oatmeal on a baking sheet and bake at 350º until lightly brown. Add the ingredients from the Oatmeal list and serve in a bowl with unsweetened soy or almond milk. Tofu Scramble – if you prefer something savory for breakfast, try the alkaline version of our Tofu Scramble by omitting the mushrooms and tomatoes. Snacks are an important meal in your day. Now that you are eating fewer starches and fats, you need to focus on consuming enough calories. You will need to eat three snacks a day (mid-morning, mid-afternoon, and evening). Hint: Always keep a container of mixed nuts and seeds on hand and chop your vegetables and make the dip of choice the night before so they are ready to go when you need them the next day. Fresh Guacamole – mash together one avocado, ¼ tsp sea salt, ¼ tsp garlic granules, and juice from ½ of a lemon. To maintain its freshness, keep refrigerated in an airtight container and place the avocado pit into the center of the container. Fresh hummus – you will notice that chickpeas (garbanzo beans) do not appear on the Low Glycemic Alkaline Food List. This is because they are only slightly alkaline. Chickpeas are not actually a bean, but a type of pea (beans are highly acidic). Garbanzo beans are allowed as a dip that you consume no more than a 1/4 cup 2 -3 times a week. This is the only food exception we included. Try our recipe. Fresh pesto – in a food processor, combine 2 cups of tightly packed fresh basil leaves, ¼ – ½ cup unsalted roasted sunflower seeds, ½ cup olive oil, 1 Tbsp. lemon juice, 1 tsp apple cider vinegar, sea salt to taste, and water if needed to get to desired thickness. 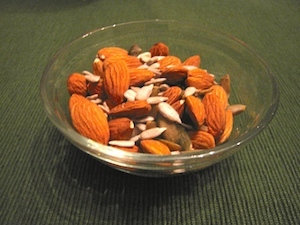 Almond Butter – make your own by soaking ½ cup almonds overnight in water. In the morning, put in the blender and turn on while slowly adding water until you reach desired thickness. Add sea salt to taste. If using store-bought butter, make sure the only ingredients listed are almonds and salt. Mixed Nuts and seeds from the Low Glycemic Alkaline Food List provide a wonderful array of nutrients, such as protein, calcium, vitamin E, and potassium to name a few. Keep a container handy for a quick snack. Dehydrated veggie crackers. With a dehydrator and some experimentation you can create your own healthy alkaline crackers. Dehydration is a long process, but if you create the dough in the afternoon and put them in the dehydrator overnight, you will have a healthy snack for the next day. Plan ahead and make enough for the entire week. Fresh Coconut is high in iron, manganese and important healthy fats. Buy a fresh coconut from the grocery store. Cracking them open is not as hard as it looks. Learn how. Don’t pour the coconut water down the drain. It’s a perfect alkaline drink filled with minerals, such as calcium, potassium and vitamin A. Fresh coconut lasts about 3 days in the fridge. Any left over can be dehydrated for snacking on later in the week. Fresh Avocado, packed with healthy fats, potassium, and B-6 that your body needs makes a wonderful snack. Slice open, sprinkle with lemon juice and sea salt and enjoy.